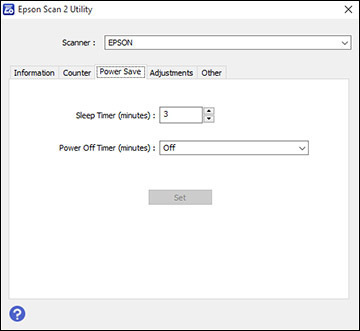 You can use the Epson Scan 2 Utility to change the time period before the scanner enters sleep mode and turns off automatically. Windows 10: Click and select EPSON > Epson Scan 2 Utility. Windows 8.x: Navigate to the Apps screen and select Epson Scan 2 Utility. Windows (other versions): Click or Start, and select All Programs or Programs. Select EPSON > Epson Scan 2 > Epson Scan 2 Utility. Mac: Open the Applications folder, open the Epson Software folder, and select Epson Scan 2 Utility. Click the Power Save tab. Select the length of time after which you want the scanner to go to sleep as the Sleep Timer setting. Select the length of time after which you want the scanner to automatically turn off when not in use as the Power Off Timer setting. Close the Epson Scan 2 Utility.